Maxim Oreshkin, at just 34 years of age, became Russia's Minister of Economic Development. Photo from Kremlin.ru. Maxim Stanislavovich Oreshkin is a Russian economist and former investment banker now serving as Minister of Economic Development for the Russian Federation. At just 36 years of age, his rise has been significant. He is seen as quite free market oriented. In 2016, for instance, stated that “the only place where we can find the accelerator pedal, is outside the state, in the private economy.” As Minister, he has faced not only typical issues like development and economic relations with foreign countries, but also extraordinary ones like sanctions and trade wars. Born on July 21, 1983, Oreshkin grew up in Moscow. His mother is a university professor and published scientist, while his older brother works in the banking industry. Oreshkin has remained quiet about his private life, however, and not much has been reported about his family. Almost nothing is known, for instance, about his father and he seems to have been raised by his mother. In 1998, he entered the prestigious Higher School of Economics, where he earned both a bachelor’s and a master’s degree in Economics. Oreshkin worked at Russia’s Central Bank from 2002-2006, starting while still pursuing his master’s degree. During his time at the Central Bank he served as a chief economist, as well as head of the balance of payments department. He then held a number of positions at private banks, both Russian- and foreign-owned. From 2006-2010 worked at Rosbank, a major Russian bank headquartered in Moscow, as both a senior manager and managing director. Another step of his early career came in 2010, when he was named Head of Research on Russia and CIS at Crédit Agricole CIB, a French bank. In 2012, he moved to the massive state-controlled Russian investment bank VTB Capital as Chief Economist for Russia, Turkey, the Czech Republic, Hungary, Poland, and the Slovak Republic. He did not stay there for long, however, and quickly landed a position at the Russian Ministry of Finance in 2013 as director of the Long-term Strategic Planning Department. His meteoric rise continued in 2015 as he assumed the role of Deputy Minister of Finance. Oreshkin made a name for himself quickly as a vocal and active member of the ministry. In 2015, he spoke against continuing to divert funds intended for long-term investment into Russia’s state pension funds. Since the economic crisis of 2014, Russia had faced budget shortfalls. The portion of revenue from Russia’s social taxes intended for investments was “frozen” and diverted for use in paying current pension needs. Oreshkin and others, however, argued that not investing that portion in Russia’s economy would hurt the economy and, in the long run, the pension system itself. He instead suggested the further privatization of Rosneft, Russia’s state-controlled oil company as a source of new revenue. Although his policy course was not taken (in part because Rosneft and its powerful head, Igor Sechin, vehemently oppose it), the incident did show that Oreshkin supported investment, savings, and liberal economic policies (and that he was willing to directly challenge powerful people to support them). He has also supported increasing taxes on oil extraction. However, he has more recently backed away from this suggestion after moving to the Ministry of Economic Development. Interestingly, his previous position would have increased state revenues, benefiting the Ministry of Finance. That previous position, however, is somewhat controversial, as Russia’s hydrocarbon extraction companies will also need considerable capital to invest in opening new fields and maintaining production. Allowing the companies to keep and invest more of their profits can thus be seen as better for economic development, Oreshkin’s new purview as minister. On November 30, 2016, Russian President Vladimir Putin appointed Maxim Oreshkin to the position of Minister of Economic Development, commenting that “you haven’t been working for very long, but as a whole you have worked for some time and you’ve proved yourself successful.” The former minister, Aleksey Ulyukayev, had fallen from grace due to a bribery scandal and has since been convicted by a Russian court and sentenced to eight years in prison and a $2 million fine. 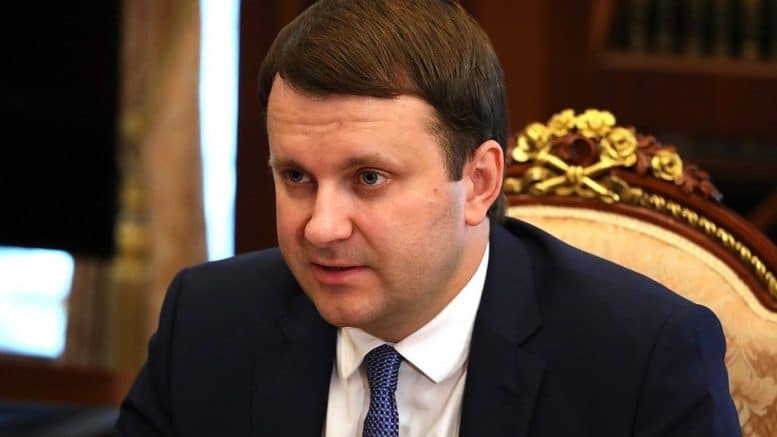 As Minister of Economic Development, Oreshkin’s responsibilities include presiding over the Ministry of Economic Development, which is the Russian government agency responsible for business regulation and facilitating a strong economy. Oreshkin also serves on the National Financial Board, a council of the most important economic policymakers in Russia. 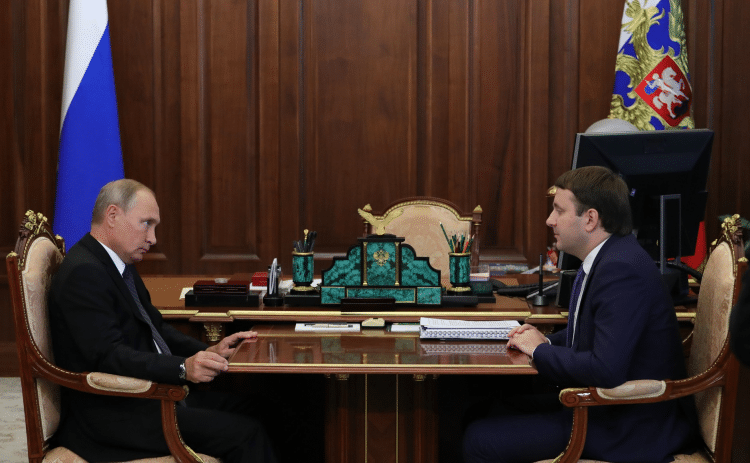 Oreshkin meets with President Vladimir Putin. Photo from Kremlin.ru. Oreshkin’s tenure has been notable for three key developments. These are the weathering of sanctions by western countries, returning Russia’s economy to growth through macroeconomic and regulatory reform, and handling trade relations with foreign countries. Sanctions have frozen assets held by some Russian individuals and organizations and blocked access to credit for them. These have included major Russian banks that, in turn, are responsible to providing lending to the wider economy. This is a big issue, as the major state-controlled banks have assets that are, on average, 94 times greater than smaller Russian banks. Thus, the banks impacted most are also the ones with the largest role in the economy. Other problematic situations caused by sanctions like reduced economic growth and the depreciation of the Russian Ruble on world markets, have largely stemmed from decreased investment, lost as credit vanished. Wider uncertainty caused by sanctions led foreign direct investment (FDI) in Russia to fall by 98% in 2015. As Minister of Economic Development, Maxim Oreshkin is keenly concerned with how to adjust to and deal with these situations. Some measures taken include trying to minimize uncertainty and calming business concerns. The most tangible example of this is in how Oreshkin has given several speeches outlining measures that the Central Bank, Ministry of Finance, and Ministry of Economic Development are taking. Although the three entities have had a reputation as warring forces fighting for policy turf, Oreshkin and other current heads have been vocal in confirming that they are on the same policy page. Furthermore, all three have found much success in being active with the press to make sure that their policy directions are publicly known. 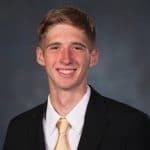 Oreshkin has been particularly adept at doing this for international investors as his knowledge of economics is complimented by fluent English. He feels that Russia will successfully weather the effects of sanctions, saying that although “Macroeconomics and financial markets will of course withstand [losses],” the floating exchange rate will moderate the problem. A floating exchange rate is set by market forces rather than a government or central bank. Theoretically, the lower demand for rubles will decrease the ruble’s value, and therefore increase the price of imports, making local goods more attractive, while decreasing the price of exports, making them more attractive outside Russia as well. Oreshkin speaks about the lessening impact of sanctions on the Russian economy. To foster economic development in Russia, Oreshkin has argued that attracting foreign investment requires promoting a “predictable business environment.” This appears to be succeeding at least a little bit, as foreign direct investment in Russia reached $20-25 billion in 2017. While still not at pre-sanctions levels, FDI has recovered significantly from the initial shock of sanctions. Oreshkin confirmed that the outlook is improving in a speech he gave at a development conference. The two main methods the Ministry is looking to use to achieve the goal of a predictable business environment are through macroeconomic policy and the regulatory environment. As far as macroeconomic policy, Oreshkin has discussed tax deductions for foreign companies that do infrastructure work, particularly in electrical grids and power generation, where Russia could gain considerably from increased efficiency. The idea behind this policy is simple. Tax deductions lower firms’ costs, making them more likely to want to invest in Russia. Reforming the regulatory environment in Russia is also important to him. He stresses the importance of “clarity, predictability and transparency” for businesses. This addresses a prominent complaint of foreign investors: that Russian regulations can be unclear and capricious. Recent legislation appears to have gone some way in resolving these issues. Oreshkin speaks on economic development in Russia. Finally, Oreshkin has done significant work with foreign countries to ensure cooperation and promote mutual investment. Some countries he has made significant strides with include India, Egypt, and China. This year, for example, Russia and India announced several measures to integrate their economic efforts. This includes not only assisting each other in catching tax-dodgers by sharing tax service information, but also improving transport links between the countries, pushing for increased rupee-ruble trade (as part of a wider effort to “de-dollarize” as additional insulation from sanctions), working to open “single-window” government service for Russian companies operating in India, and, of course, growing trade in arms and defense, which has historically been strong between the two countries. Additionally, Oreshkin will be one of the key speakers at the first Russia-India Strategic Dialogue held in St. Petersburg, which will seek to advance the two countries’ cooperation in agriculture, small- and medium-sized business, transport, industry, and digital transformation to speak at a conference on Russia-India relations. Minister Oreshkin quite recently announced that the EAEU will soon open talks with Egypt about a possible FTA. This is linked to a Russian industrial zone being established in the Suez Canal Economic Zone. It has potentially much wider implications, however, as much of Egypt’s considerable wheat imports and arms purchases come from Russia and Russian tourists contribute greatly to Egypt’s important tourism industry. 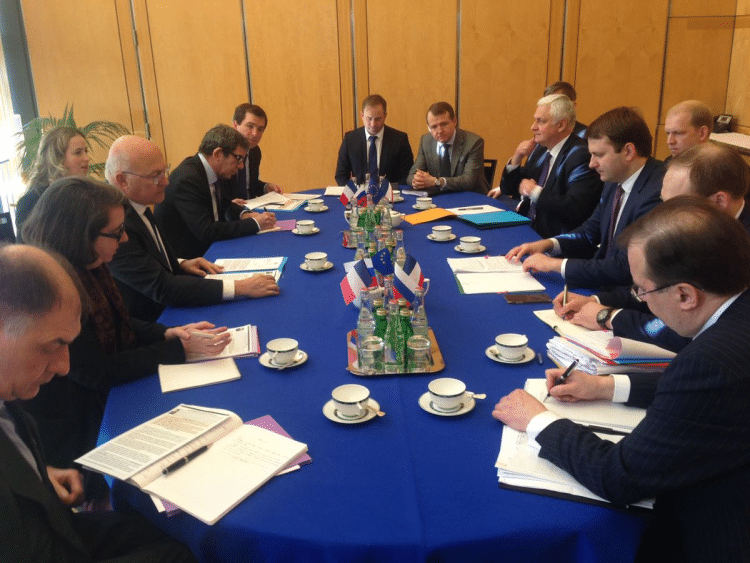 This will also help strengthen the EAEU, another long-term policy goal for Russia. Economic relations between Russia and China are another important issue. Some key developments include boosting trade in rubles and yuan to substitute for the dollar, billions of dollars’ worth of investment, and upgrading infrastructure to facilitate trade. Minister Oreshkin has expressed a desire to boost exports to China in light of the ongoing trade war between China and the United States. Cooperation has helped both countries assuage the effects of sanctions and tariffs imposed by the United States. While such a relationship would not have been expected during the Cold War, it makes more and more sense from a comparative advantage point of view—Russia has natural resources and China has manufacturing might. Oreshkin has also been vocal on sanctions and tariffs imposed by the US on Russia. For instance, following steel and aluminum tariffs imposed by the United States, he has “calculated the damage done to our economy by this decision of the United States, it stands at about $600 million.” The tariffs have harmed Russia’s steel and aluminum producers. He estimates that Russian retaliatory duties have brought in about $100 million. He also stated that the US moves are counterproductive and hurtful to all countries, including the United States. In July 2018, Russia filed a complaint with the World Trade Organization (WTO) that the United States’ tariffs were unlawful under WTO rules. Maxim Oreshkin has received both praise and criticism for his views and performance in both private sector and governmental positions. Anton Siluanov, the Russian Minister of Finance, described Oreshkin as a “classy macroeconomist” and a “super-qualified specialist.” Likewise, Elvira Nabiulina, head of the Central Bank, said that Oreshkin is, “one of the strongest macroeconomists in the country.” This is high praise indeed from some of the most important figures in the Russian economy. In government, he is seen by some as a favorite of President Putin. However, both Russian officials and Oreshkin himself have not seemed inclined to accept this title. It is clear, however, that Oreshkin’s intelligence and capabilities are well-respected. After a formal economic education and a career in the banking industry, Oreshkin, although young, is seen as a capable technocrat. Others have completely rejected the suggestion that Oreshkin is a favorite of President Putin. Common criticisms include that he is looking after the interests of liberal elites rather than Russia. Nikita Krichevsky, head researcher of the Institute of Economics of the Russian Academy of Sciences, said that, “Not Putin is behind Oreshkin but a narrow liberal group of people who are orientated to officials of the Central Bank, Sberbank, etc.” Oreshkin is part of a group of economic liberals within the government that face opposition from some hardliners who want to challenge Western democracies more. The career of Maxim Oreshkin is on an upward trajectory. He seems capable, well-liked, and an effective leader for the Ministry of Economic Development. There has been some speculation that President Putin might endorse him as a successor for the presidency when Putin’s term expires, but for now that is all it is—speculation. In the meantime, it can be expected that he will continue to look after the interests of the Russian economy as he understands them and at least attempt to usher in reforms that will grow it.